New York has always been on my wishlist and for a long time, even before the holiday was booked, I've had an instagram collection of cute restaurants that I simply have to visit. So when the day rolled around, we had a plan. 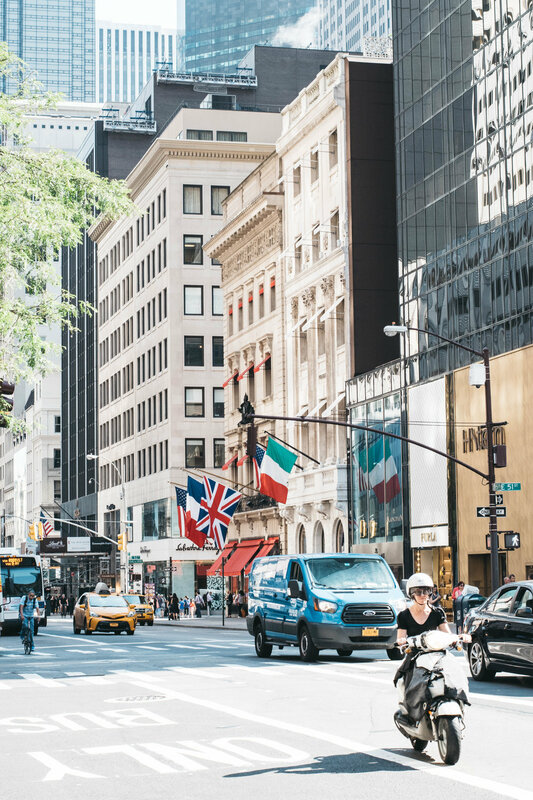 Unlike cities such as London and Paris, the attractions in New York are incredibly spread out - almost to the point where it's worth planning your trip by area. But similarly to our Washington trip (read about that here), there is far too much to include in just one post - so watch this space! To get to New York we got a $10 bus from Philadelphia. It was hardly glamorous but for a two hour journey, it was hardly a big issue! If you're within a close distance, I'd definitely recommend checking buses out - especially as trains in America are over $100 a person! Once in New York, we relied heavily on the Subway. Subway journeys are priced at a flat $2.75 as a single fare, however you can buy a $32 7-Day Unlimited rides card which might work better for you depending on how long you're there. I'd suggest planning your trip by area as not everything is close to each other. Because location was one of the most important things, we stayed in a hotel just off 31st Avenue and Broadway which meant we were not only incredibly close to the Subway and within walking distance of Times Square. The hotel we stayed at was The Wolcott which didn't include breakfast or WiFi, but we couldn't argue with the location! Prices are around $200 a night. What better way to start off our New York journey than with a visit to one of the best views in the city. 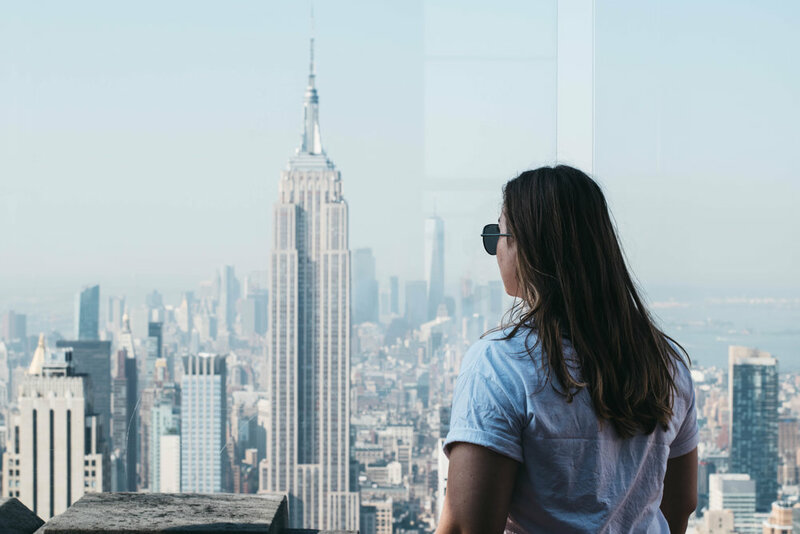 One of the most famous attractions in New York is the Empire State Building but if you want to avoid the crowds, I'd highly suggest visiting the Top of the Rockefeller Centre instead. We booked a 9am ticket and were almost the first up there which meant we weren't fighting the crowds for a view. There's so much hustle and bustle in the city that I'd highly recommend the Rock for a slightly less crowded experience. Adult tickets are $37 each but if you're also planning on visiting MoMa (Museum of Modern Art), you can get a combined ticket that will save you $7! Within about 15 minutes walk from the Rockefeller Centre is the Museum of Modern Art which is probably one of the most popular Art museums in the city. The Art in here was incredible- as my brother said, if a gallery had just one of the paintings here, it would be a centrepiece. Famous works range from Van Gogh's Starry Night to Andy Warhol's Marilyn Monroe Print to Monet's Water Lillies. I'd highly recommend getting there early & grabbing one of the free audio guides. Probably one of the "quickest" things to see in the city is the 9-11 Memorial. Dedicated to those who lost their lives when the planes hit the World Trade Centre in 2011, the memorial is incredibly moving. Unlike a classic statue, the memorial is sank deep into the Earth, illustrating the location where the towers once stood. 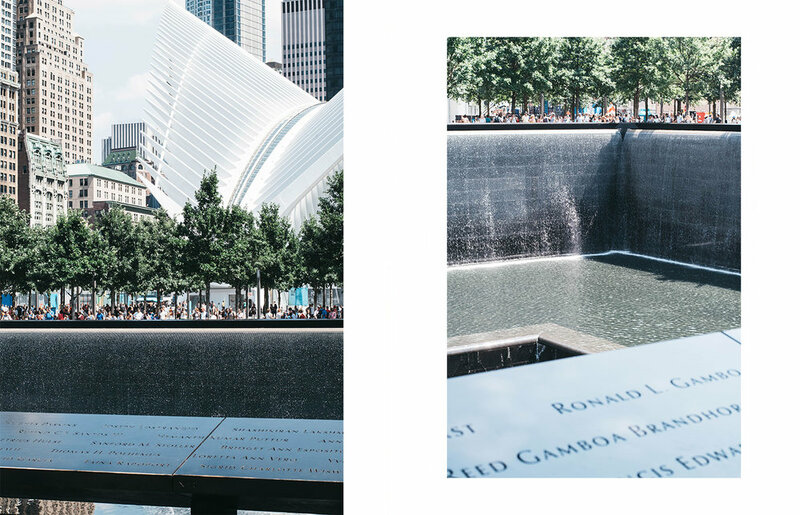 There was something beautifully calming about the water feature, and the presentation of names around the edges (including those who died trying to save people), was incredibly tasteful. There is a museum which is $24 per adult but we didn't visit it due to time constraints. It's easy to get to via the Subway - just look it up in advance to see which line is best for you. Located in the Northern part of Central Park is the Jacqueline Kennedy Reservoir which gives an incredible view of the city. This was probably one of my favourite locations as it was so empty and quiet compared to the rest of the city! There are loads of benches so it's an ideal place to sit and have a bit of a sit down - especially after all that walking. It's really beautiful and a nice change from all the city architecture. The first place we ended up eating at was Adrienne's Pizza which is located close to Wall Street, near the river. We genuinely stumbled across it in a tired daze but were glad we did! The pizzas are huge so this is very much a place where you'd get a few and share them but they were delicious. Unlike many pizza joints, you chose your base and then build you pizza by choosing all your toppings. We opted for a standard pepperoni and a parma ham and basil option. Both were incredible. Not only was the food brilliant but the tables were in an alley filled with tables from other food places so the atmosphere was wonderful (and great for people watching!). These baby pink Cupcake ATM's are all over instagram and for a good reason! Not only super cute and photogenic, Sprinkles makes incredible cupcakes. But whilst it's famous for cupcakes, we went for ice-cream which was probably the best I've ever had. I went for the red velvet ice-cream which was literally ice-cream mixed with the famous cupcake. So. Good. Definitely make a stop here, even if it's just for cute pictures. If you're from the States, Shake Shack might not seem that exciting but for us Brits, it's pretty bloomin' exciting. We went to the one in Madison Square Park which is outside and beautiful. As we were there in the Summer, it meant we were able to enjoy the warm evening and it made a prime spot for people watching. If you're in the area, I'd definitely suggest getting a Shake Shack in a park so you can enjoy the weather! And that's part one. Phew. Have you been to New York? What were your recommendations?